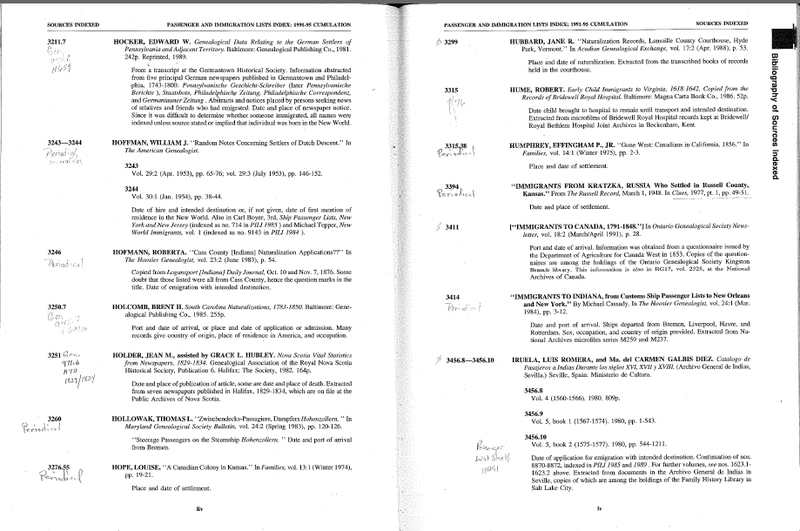 a3Genealogy: Looking for Immigrant Passenger / Naturalization? 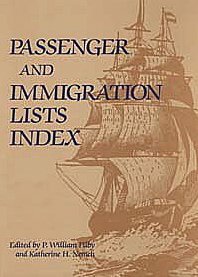 Have you tried referencing Percy William Filby's Passenger and Immigration Lists Index for that impossible immigrant? Did you know it covers over 5 million passengers, spanning 153 - 1900? Sure it can be more challenging than tapping inquiries in online subscription bases, but what if you need to widen your search? Filby’s cumulated Volumes give us one more glimpse of hope when looking for that elusive ancestor, or trying to identify a family unit, or locating naturalization papers. And, you, probably already know that ship passenger lists prior to 1820 were not necessarily preserved and housed in a central location, even though now most are held at the National Archives. If nothing else, researchers will broaden their knowledge of passenger and immigration research sources by using this collection that is chock-full of locations, books, and information location. If you visit a genealogy library, like the Midwest Genealogy Center (MGC), in Independence Mo., chances are, the sources (periodicals, passenger books, and reference books) are already on the shelf. Matter of fact, at the Genealogy library, they have most often hand-scribbled in the margin the equivalent of a “finding aid.” a3Genealogy is called upon frequently to review the Filby's Index and locate and analyze the information at MGC. 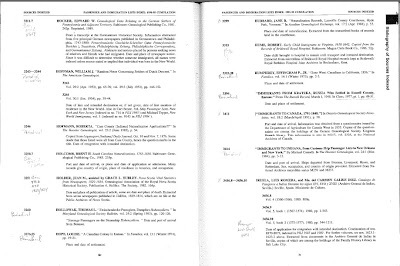 Often called Filby’s, nicknamed after the author/editor P. William Filby the Index of Ship's Passengers was originally published in 1981 with 500,000 passenger records. Subsequent to the initial 3 volumes additional supplements have been issued - about 1 per year for about 13 years. 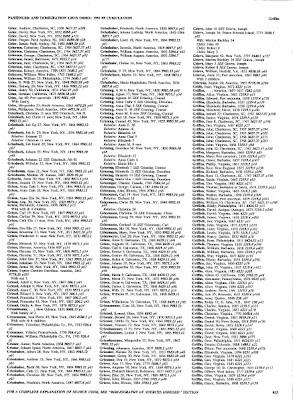 So now the index contains more than five million records of US immigrants in its thirty-three supplements. Researchers must review all of the supplements in ferreting out their ancestors. Time consuming? Yes, but remember it is alphabetize. Keep in mind, though, that names may be spelled incorrectly. We often suggest, you widen your search. Remember, for example, the letters K and C are audibly similar to a record keeper or non-speller. So, your Casell, may be a Kasell. Oh, and don’t limit your search to passenger lists. It can also assist in locating naturalization records and the associated courts. The listing of passengers, taken from many different sources and compiled alphabetically by surname, makes it easier to identify family clusters. Occupations are also noted which can assist researchers in narrowing ancestors who were blessed with common surnames (i.e. Smith, Williams, Jones). Since various ships-lists are provided, researchers can more easily obtain the full manifest and perhaps review the original source. Filby meticulously created a code of resources. And the Midwest Genealogy Center (MGC) not only “broke the code” (front of book) but provides the researcher with the key to the stacks. Neatly noted in the margin of each coded page, the MGC staff has scribbled the stack location of available in-house sources. Many of the sources are truly in-house; but others may not be available at MGC. Lucky for us, that too is noted. 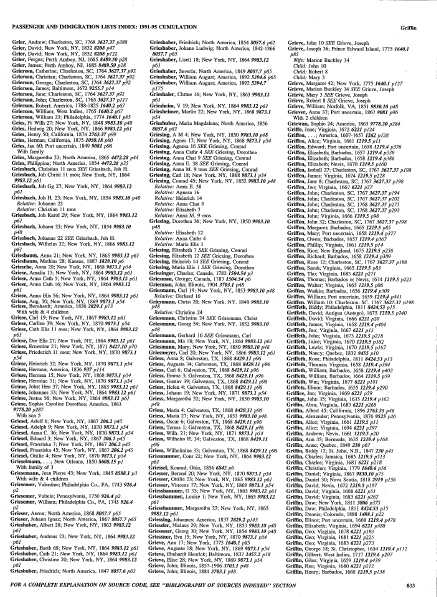 Of course there are online index databases, but not half as fun and not as easy to analyze (IMHO). But decide for yourself. Be sure to look at the Passenger and Immigration Lists 1500-1900 (PILI) on the WorldVitalRecords.com site.